This year's IFA marks one of the largest product announcements by Sony in one go. Alongside the anticipated Z3 flagship, the company unveiled the Z3 Compact, the next generation of the mini that ruled last season. The flagship offerings were followed by a new device in Sony's entry-level E lineup, the Xperia E3. Touted as the company's "most affordable LTE device", the Xperia E3 is heading to emerging 4G markets and hopes to offer Sony quality in the lower price ranges. Moving on from smartphones, Sony is also outing its first compact Xperia tablet in the Xperia Z3 Tablet Compact. The Tablet Compact looks to offer Sony's robust Z-series performance in the sub-10-inch range, while keeping the weight and thickness down. Finally, when it comes to wearables, Sony has updated two of its current smartwatches to provide even more robust functionality. The Sony SmartWatch 3 will be the first Sony device to run Google's Android Wear platform, while the SmartBand Talk takes its current SmartBand wearable and adds a 1.4" e-ink display as well as call handling and voice commands. With one of the shortest release cycles in the industry - just six months since the release of the Xperia Z2 - Sony is not able to make as many steps forward from one flagship generation to the next as other manufacturers. What it does do, is continue to refine its excellent omnibalance design strategy with each generation. Their latest Z3 is another step in that evolution. The internals of the Xperia Z3 have remained largely the same - a Snapdragon 801 chipset, clocked higher at 2.5GHz and of the MSM8974AC variety. You'll also find the same 3GB of RAM and 16GB of storage, while the battery has been downgraded by 100mAh to 3,100mAh. Despite this, Sony claims that the Z3 will have better battery life than the previous Z flagships - up to two full days (although under what usage patterns is unclear). Sony also claims that 4K displays at this size don't result in significant improvements in image quality, so you'll find the same 5.2-inch 1080p screen on the Xperia Z3. While the camera sensor remains the same at 20.7MP, Sony has added several improvements from their Cybershot line that the company hopes will result in better image quality. The Xperia Z3 adds a stylish rounded metal frame to complement its dual glass design on the front and back. The corners are covered in special nylon corner caps which are designed to better protect the aluminum frame from dents in the event of drops. As before, the Xperia Z3 will be waterproof, and has an IP68 rating. First, ISO sensitivity has been increased to 12800, which should result in better low-light shots. Second, Intelligent Active mode will help minimize movement blur during video recording, and finally the lens has been upgraded to 25mm for wider shots. In a feature borrowed from the PS Vita, PS4 integration will be even more robust in the latest Sony lineup. Dubbed PS4 Remote Play, all three of the new Z3 series devices will be capable of streaming games from a PS4 system on the same wireless network. Attaching a dualshock controller to a Z3, Z3 Compact, or Z3 Tablet Compact means you'll be able to play PS4 games in full while using one of those devices as a display. This is a feature that's expected to become fully available in November, with Sony also having plans to make it available on older Xperia devices as well. Alongside the Z3 Compact and Xperia E3, several slick color schemes are available apart from the usual black and white. The silver-green color exclusive to the Xperia Z3 is especially impressive. The Sony Xperia Z3 is expected to become available globally this month. There will also be a dual-SIM version available, although without the silver-green color option. With the Xperia Z3 Compact, Sony has revisited the true compact flagship concept; one that's set to have virtually identical specs to its large-screen counterpart. The Z3 Compact is almost every bit as impressive as the Xperia Z3, featuring the same processor, GPU, and internal storage, while sporting a 4.6-inch 720p display. Compared to its Z1 Compact predecessor, the Z3 Compact is thinner and lighter, and features more "youthful" colors like orange and green. The battery has been upped to 2,600mAh, but it loses the metal frame of the new Z3 flagship. The Z3 Compact takes a slightly different approach than the Z3 flagship, namely its dual-glass panels seem to grow out of the front and back of the device rather than sit flush with the sides. The pleasantly beveled edges sit very comfortably in the hand, and help provide a distinct look that the Z3 Compact has all to itself. Otherwise, the Z3 Compact shares many of the features introduced with the Z3 - the 20.7MP sensor with increased ISO sensitivity and 25mm lens, the nylon corner caps to prevent damage, and extensive PS4 connectivity support. Of course, the IP68 dust and water resistance rating is here as well. The Sony Xperia Z3 Compact is slated for release alongside the Xperia Z3 this month. We also have a Sony Z3 Compact video hands-on and camera samples in a separate article, which you might like to check out. Sony has released its first midsize tablet in the Xperia Z3 Tablet Compact. The device comes with an 8-inch diagonal, but what really impresses is the ultra-slim 6.4mm waistline, as well as the weight - at just under 270g, the Z3 Tablet Compact is impressively light in-hand. The 8-inch display is of the WUXGA variety (1920 x 1200px), with Sony again claiming that QHD displays don't offer much more sharpness than 1080p screens, but that justification wears a bit thin for a screen this size. Nevertheless, the Z3 Tablet Compact is perhaps the most suitable of the new Z3 lineup to take advantage of the exclusive PS4 integration. The Z3 Tablet Compact has moved away from the dual-glass panel design that Sony used with the first Xperia Tablet Z. Instead, it opting for a matte rear panel that's very resistant to fingerprints, and undoubtedly helps keep the weight down compared to glass panels. Inside, you'll find the same high-performing Snapdragon 801 chipset as on the Xperia Z3, alongside 3GB of RAM and 16GB of expandable storage. In the imaging department, there's an 8MP rear camera and a 2.2MP front-facer, while a 4,500mAh battery will power it all. The device is IP68-certified for dust and water resistance, and features the nylon corner caps of the Z3 smartphone. The Xperia Z3 Tablet Compact is expected to be released alongside the Xperia Z3 this month. The Sony Xperia E3 is the latest member of Sony's entry-level E series, and is meant to be the company's most affordable LTE device. Targeted at emerging LTE markets, the E3 is trusted to bring Sony quality to the budget range. The Xperia E3 will sport a 4.5-inch display of the FWVGA (854 x 480px) variety, alongside 1GB of RAM and 4GB of expandable storage. There's also a 5MP rear camera and a 2,330mAh battery to round out the specs. The Xperia E3 will have some, but not all of the new Sony software features introduced with the latest Z3 series, as well as the same copper color variant. The bright yellow color will be exclusive to the E3. 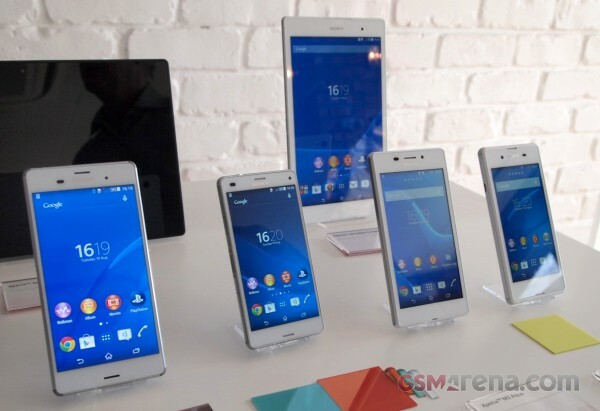 The Sony Xperia E3 is expected to be released alongside the new Z3 series this month. There will also be a dual-SIM variant available. The Sony SmartWatch 3 is expected to get released alongside the new Z3 series this autumn at €229. Additional bands will be able to be purchased for 25. Like the SmartWatch 3, both bands are IP68 water and dust resistant, and the SmartBand Talk will have a 70mAh battery that's rated for up to three days of uptime. The Talk will come this autumn alongside the new Z3 series for 159.